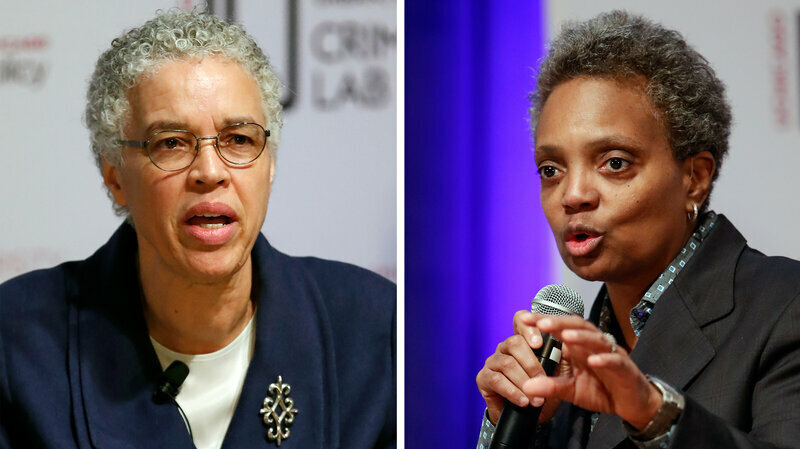 Chicago mayoral candidates Toni Preckwinkle (left) and Lori Lightfoot speak during a March 13 forum on crime and violence. No matter who wins Tuesday’s election for mayor of Chicago, the United States’ third-largest city will be led by an African-American woman for the first time. The historic race pits Cook County Board President Toni Preckwinkle against Lori Lightfoot, a lawyer and former head of a police oversight board who also would become the city’s first openly gay mayor. The free-for-all campaign has represented a sharp contrast to almost every past election in a city that has been synonymous with Democratic machine politics and bossism for nearly a century. In the first-round election in February, Lightfoot, 56, and Preckwinkle, 72, were the top two vote-getters among 14 candidates. Lightfoot led the crowded field with 17.5 percent of the vote, while Preckwinkle received about 16 percent, qualifying them for Tuesday’s runoff election. The wide-open succession battle began with a surprise retirement announcement last year from two-term Mayor Rahm Emanuel, a prolific fundraiser and former White House chief of staff to then-President Obama. The famously combative and profane Emanuel had earlier said he planned to run for a third four-year term. But Emanuel’s popularity suffered major blows as he grappled with the city’s deep financial crisis and the increasingly volatile relationship between police and the black community. Those tensions rose dramatically after the 2015 release of a videotape showing a white officer firing 16 shots into Laquan McDonald, killing the 17-year-old African-American. The only way we are going to carve a new path for the city … is to vote for change. Both Lightfoot and Preckwinkle have sought to brand themselves as much more progressive Democrats than Emanuel, a centrist who often feuded with public-employee labor groups, including the teachers’ union. After recent polls gave Lightfoot a big lead, many Emanuel backers in the city’s business community gravitated toward her. Lightfoot also appeared to benefit from the anti-incumbent, reformist mood of an electorate rocked by yet another City Hall corruption scandal. It’s easy to talk about change. Change is not easy. It takes hard work. In January, federal prosecutors alleged attempted extortionby veteran City Council member Edward Burke. 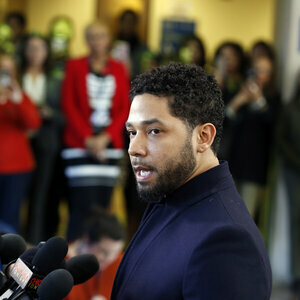 And they accused Burke of shaking down a businessman to give a campaign contribution to Preckwinkle, who is also leader of the Cook County Democratic Party. Preckwinkle and her backers countered that Lightfoot is not a true progressive or outsider, having worked under Emanuel and former Mayor Richard M. Daley. Preckwinkle also warned that Lightfoot’s thin political résumé shows she would be far too inexperienced for the daunting job. When I was an 8-year old child in 1968, I took part in a voluntary school-bussing program to promote desegregation in Syracuse, New York. In the spring of 1968, soon after the assassination of Dr. Martin Luther King, letters were sent to some families in the suburbs of Syracuse asking if they’d be interested in having their child attend a school in the inner city of Syracuse. At the time, I remember my father and mother debating why a young white boy like me should be allowed to go to a predominantly black school. Many relatives and family friends were concerned it may not be a good idea to send me far from my neighborhood. My father, who was an editor at a large newspaper in Syracuse, was supportive of me being bussed. In time, my mother became supportive of the idea too. To my parent’s credit, they didn’t make the decision for me to attend the school and didn’t pressure me. Before a decision was made my parents asked me what I thought of the idea. At first I didn’t know what to think. However… I soon came to support the idea and agreed to change schools in the fall. The adventure had begun. To this day I still am glad I had the experience of going to Martin Luther King Elementary. My memories of the school have many positive aspects. However, the transition to my new surroundings took a while. Although it was difficult to get used to sitting on a bus for over an hour a day, I eventually got used to the ride. In addition, many features of the school were radically different than what I was used to. For one, I felt alone as a young white boy in a sea of black faces. In addition, since we had very few blacks in my suburban school, I now knew what it was like to be a minority. Understandably, my appearance at the black school caused reactions in my black classmates. For more times than I can remember I was called “Honky” as I was jokingly asked by my classmates whether I was lost or why I was far from home. Interestingly and contrary to the concerns of many, I was never beat-up or in any fights in my new school. Although there were a few times when I was nudged by assertive boys or glared at, I never had concerns for my well-being and made friends in my new school. In particular, I became close friends with two young black boys in my 4th grade who looked out for me. We made an interesting trio on the campus of school. In addition to my close friends looking out for me, what helped me cope was the fact I realized at a young age that who I was as an individual actually mattered more than the fact I was white. Soon after I got to my new surroundings I learned to defuse tensions caused by my whiteness. What I quickly learned was that if I was defensive or reacted angry to the joking caused by my appearance, that things could escalate. When I look back on my experience with the integration of blacks and whites, I realize that the experience definitely helped me understand that it is who we are as human beings, regardless of race, that truly matters. As many of us remember, many appeals were made by leaders such as Martin Luther King to not only seek equality of opportunity for blacks, but to also have people focus on the content of the character of each person as opposed to just their skin color. When we fast-forward to the issues of today, lets try to understand that the modern concept of white privilege can be used to judge a person solely on the color of their skin. To truly heal racial tensions in America it may be best if we try not to look at outward appearance and race as a predominant factor in our lives. Obviously, racial differences are there and cannot be ignored. And yes…there is such a thing as the fact that certain whites go through life in ways that may be easier than some blacks. However, if we focus on race predominantly in judging individuals we’re basically reinforcing a stereotypical approach. In today’s America it is valid to seek equality of opportunity for minorities. However, to make race such an intense focus in our day to day lives creates high levels of tension throughout all of society. Ultimately, and in the final analysis, it is the content of our character as individuals that matters most in life. When all Americans of all races put the quality of an individual’s character above their outward appearance, we may finally get to the place that Martin Luther King dreamt about. Turns out that an Old Dog can be taught new things. For those of you who do not know me, I am a 62-year-old White guy who was born in the South-Eastern United States to Southern parents and I live in the South-East now. I did spend my “growing up years, age 9-20” in the Northern part of the U.S. though. I spent almost all of my adult life behind the wheel of a truck driving all over the U.S. and Canada. During those 32 years as a driver I met many hundreds if not a few thousand people all across our Country, of almost all races, ages and genders. I also had a lot of contact with people of differing education levels and job functions. This also included many people from different Nations who were over here working or who were here on their vacations. The reason that I am telling you these things is because I know as a total fact that most everyone who has not actually done the job of a long haul truck driver for at least two or three years does not really have a clue about the realities of that profession. Meeting with and having to deal with many different ‘kinds’ of people is just part of that job. I have seen racism and discrimination first hand at least a few hundred times in my life and quite a few of those times it was directed straight at me. I have personally come across people who simply hated me because I am a White guy and I have had people hate me because I was financially poorer that they were. I have also come across quite a few people who hated me because I was a truck driver. I have used the word hate for two reasons, one is because it is the truth and two, is because of the stupidity and evil that it implies. The most racism that I have personally seen has been from Black folks toward White folks, I guess the next most that I have noticed has been from Hispanics toward White folks. There have been other times with other races where I have been treated poorly because I am White and to some extent I do understand it, I don’t agree with it or condone it, but I do understand it. I have been treated poorly by Native Americans, Orientals, middle-Easterners and about every other race of people I could possibly think of yet not nearly as badly or as often as from Black Folks and from Hispanics. I believe that the reason behind this fact is the reality that I simply came into contact with more Black and Hispanic folks than I did with other people. Outside of the race issue it seems that we humans can always find a reason to hate people who are not exactly like we ourselves are. Hate, in my opinion, is a mental and moral disease no matter who it is practicing it. I have spoken with and dealt with people from a plethora of Nations who were here in the U.S. who simply hated Americans, especially Whites and Blacks. You may ask, well why were they here if they hated us, the reason was simple, for the money they could make here compared to in their home Nation. There is also the issue of human hate one toward another because of the religion they practice or because a person is an Atheist. Folks, all of this hate is folly, ignorance and evil! The only place hate ever gets anyone, is into an early grave and an express ticket to Hell. I mentioned a moment ago that I “understood” why some people, or some races hate White folks so I am going to explain that statement now. But first one disclaimer, I totally disagree with lumping all people or races of people into one all-inclusive lump, not ‘all’ people of any race are racists, there is always many exceptions. Yes there are White people who hate a, or all, other races of people and vice versa. Yet the reason I said that I can see why some other races of people hate White Americans is because they themselves are so used to being treated badly by folks like me, a White American. Many times I have walked up to people, or a person, who was of a different skin color than I am and you could see they were waiting to see how I was going to speak to them. When they realized that I didn’t care about our differences and that I talked with them as an equal you could see the hardness in their eyes and on their faces soften and we could have conversations as if we were old friends. When we as people are constantly being treated horribly by another race, nationality or religion, we tend to grow hard toward them ourselves, we become that which we hate. The title speaks of me being wrong about how much racism (hatred) there is here in the U.S. toward non-whites and that it was worse than I had realized and this is a true statement. To me (a long time registered Independent) I did not realise just how many White Racists there are here in our Country, until Don-key Trump came along. There is one thing about a ballot box, a person can show their true selves behind their curtains. President Trump shows his hate of basically everyone who is not a multi-billionaire White person constantly, by his actions and by his words. The President’s main base of supporters is lower educated White Folks, mostly the men. To me it seems that what the polls, the elections the media and Trump rallies are telling us is that the Republican Party has become the White People’s Party and that a huge amount of those White people are fundamentalists racists. My whole life I have seen and heard White People treat other races of people horribly. But as I said earlier, until Don-key Trump came along I did not realize just how many White People here in the States possessed this Moral Disease within them. Sen. Cindy Hyde-Smith recently drew criticism for remarks condoning public hangings and the Confederacy. Cindy Hyde-Smith, the Republican Mississippi senator who made comments condoning “public hangings,” attended a “segregated” school when she was younger, the Jackson Free Press reported Friday after unearthing a 1975 yearbook photo. The school, Lawrence County Academy, was set up for white parents to avoid sending their children to school with black children, according to the Free Press. Many such schools, dubbed “segregation academies,” were created in the South following desegregation as inexpensive, private educational options. Hyde-Smith is identified in a caption beneath the yearbook photograph, which shows a row of cheerleaders smiling as they lie on the ground, propped up on their elbows, as a girl dressed in what seems to be Civil War–era regalia stands in the center holding an apparent Confederate flag. Lawrence County Academy was established in 1970, one year after the U.S. Supreme Court ordered Mississippi to desegregate its schools. For 15 years after desegregation became law of the land, Mississippi dragged its feet on integrating black and white students. A former student who provided the photo to the newspaper said she realized at the time that her parents sent her to Lawrence County Academy to avoid interactions with black students. Segregation was not openly acknowledged at the school, she said. Hyde-Smith sent her daughter to a similar school, Brookhaven Academy, which is nearly all white despite being located in a majority-black town. The senator faces Democratic challenger Mike Espy in a special election Nov. 27. She was appointed by Mississippi Gov. Phil Bryant to fill the seat vacated in April by former Sen. Thad Cochran, who stepped down for health reasons. Hyde-Smith has been heavily criticized this month for making racist comments on the Confederate South. Although she later apologized for her remark, she accused her opponents of twisting her words for political gain. “And I think that’s a great idea,” she said. President Donald Trump, of whom Hyde-Smith has been a vocal supporter, will hold two rallies in Mississippi on Monday to whip up support for the Republican candidate. Actress Jada Pinkett Smith said that the racial divide between women of color and white women should shrink because they have all been oppressed for their gender. But she candidly revealed she carried her own prejudice. Asked by her mother, Adrienne Banfield-Jones, whether she was mistreated specifically by a blond woman, Pinkett Smith remembered being teased about her hair and belittled by white women throughout childhood. Pinkett Smith, a mother of two who’s married to actor Will Smith, recalled a professional instance in which her bias played a part. “I was going to do an interview with this blond woman and I thought twice about it,” Pinkett Smith said. “I thought, ‘I don’t know if I want to do that.’ That was my first instinct because of how she looked! And I was like, ‘Oh! That’s no different.’ That doesn’t give me the right to clump all blond women in one. Around 4:00 a.m. ET on Sunday morning, a disgruntled group of drunken men were asked to leave Manny’s Blue Room Bar in the Chicago suburbs. According to WGN-TV, one of those men returned with a gun and opened fire. Amid the chaos, 26-year-old armed security guard Jemel Roberson chased one of the suspects outside of the club and apprehended him at gun point. Roberson seemingly did everything right. But when Midlothian police officers arrived to the scene, one of them saw the security guard pointing a gun at the suspect, and shot and killed Roberson on the spot. Many anti-gun control politicians and advocates, including President Donald Trump, frequently say that armed security guards are the only way to stop mass shootings. Last month, after eight people were killed at a Pittsburgh synagogue, Trump suggested that there should be armed guards at churches and synagogues. This is an offshoot of a frequent National Rifle Association talking point, that the only way to stop a bad guy with a gun is a good guy with a gun. Roberson was both an armed security guard and a good guy with a gun. He risked his life to apprehend a shooter. And police killed him anyway. Like many NRA-based talking points, this one doesn’t seem to apply to black people. On social media, loved ones mourned the loss of Roberson. LeAundre Hill, a pastor and family friend, said that he was a great pianist who had just played at HIll’s grandmother’s funeral on Friday. Jemel has played for @PurposedChurch for the last several years and just played for my grandma’s funeral Friday and now he is gone. Roberson was also reportedly studying to be a police officer. The officer who killed Roberson has already been placed on paid administrative leave, per protocols. WGN-TV reports that the Cook County Sheriff’s Office is conducting the criminal investigation of the original shooting, and the State Police Public Integrity Task Force is investigating Roberson’s death. Friends and family have already set up a GoFundMe account to raise money for Roberson’s burial. “Jemel Roberson was a young man who was greatly loved by all who knew him. He was the light of his mother Beatrice’s life, and was a devoted loving son,” the GoFundMe reads. “Jemel was a gifted basketball player and musician, and his love for God and his family were at the forefront of his life. She has Native American in her family tree going back generations, according to a report Monday. Carlos D. Bustamante, a Stanford University professor and expert in the field, determined in his analysis that a pure Native American ancestor appears in Warren’s family “in the range of 6-10 generations ago,” the Boston Globe reported. That’s consistent with the Massachusetts Democrat’s family lore from her Oklahoma upbringing that her great-great-great-grandmother, O.C. Sarah Smith, was partially Native American. The release of the DNA findings appear to be a way for Warren, who is expected to run for president in 2020, to put the issue to rest and remove a talking point for her opponents. In a video posted on her website that begins with Trump calling her “Pocahontas,” Warren is speaking to Bustamante. “Now, the president likes to call my mom a liar. What do the facts say?” she asks him. “The facts suggest that you absolutely have a Native American ancestor in your pedigree,” he replies. Tamping down accusations made by many Republicans that she parlayed her heritage to benefit her career, the video includes a number of law professors — including from Harvard Law and the University of Pennsylvania Law School — attesting that she was hired for her ability. “Her heritage had no bearing on her hiring. 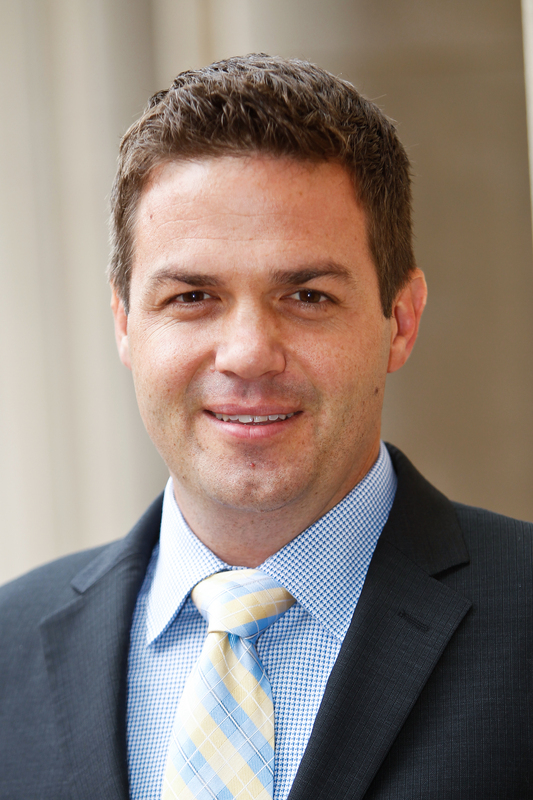 Period,” Jay Westbrook, a professor at the University of Texas Austin School of Law, says in the video. Warren also includes family members in the video who call out Trump for mocking her. “He’s talking about stuff he doesn’t have any idea about,” says her nephew Mark Herring. Editor’s Note:This post is part of “Teacher diversity in America,” a series from the Brown Center on Education Policy that examines minority under-representation among public educators in the U.S.
An increasing amount of evidence shows that alignment in the racial or ethnic identity of teachers and students is associated with a range of positive student outcomes, from test scores to disciplinary actions to teacher expectations. Due to the under-representation of teachers of color in the current workforce, minority students stand to disproportionately benefit from efforts to increase teacher diversity. With this evidence, it is easy for many practitioners and policymakers to take a next logical step, concluding that, because minority students tend to benefit uniquely from diverse teachers, teachers of color will be most beneficial in schools serving large numbers of minority students. Thus, any new teachers of color are often steered (whether covertly or overtly) toward high-minority schools. Taken to an extreme, given the tenacious grip of racial segregation on America’s schools, we could have a school system where the teacher workforce is every bit as diverse as its students—and perhaps every bit as segregated. In addition to the risk of creating a racially segregated workforce, the logical leap above is misguided for at least two reasons. First, it ignores the evidence showing that teachers of color benefit white students—perhaps not always through test scores, but through pro-social beliefs and attitudes. Second, schools serving large numbers of minority students already tend to have the most racially diverse workforces, while many students of color in predominantly white schools have virtually no exposure to teachers of color. As districts and states across the country pursue racial and ethnic diversity among teachers, we should pay attention to how teachers of color are distributed to avoid creating another layer of school segregation. As districts and states across the country pursue racial and ethnic diversity among teachers, we should pay attention to how teachers of color are distributed to avoid creating another layer of school segregation. After briefly conceptualizing segregation and its manifestations in schools, we report our findings that teachers are even more segregated than students in the U.S., suggesting the need for a new framework around the hiring of non white teachers. School segregation does not exist in a vacuum, but is part of an interconnected structure of segregation that extends to residence and employment. Residential segregation can be primarily attributed not to self-segregation of minority racial groups but instead to decades of federal policy that prevented nonwhite families from acquiring mortgages, redlining practices, the strategic placement of interstates and highways throughout the 20th century, and individual actions of white families. Employment segregation takes the form of predominantly white jobs having an average salary four times higher than that of heavily black or Hispanic jobs. Furthermore, a 2017 meta-analysis of callback rates for fake resumes with racially coded names reveals the continued presence of simple employment discrimination. Each of these factors significantly influences the racial segregation of students across schools. Although the school integration movement achieved significant gains following the landmark 1954 Supreme Court decision on Brown v. Board of Education, many of its victories have been reversed in the past 20 years, returning the American public school system to segregation levels last seen during the Civil Rights era. Resegregation in recent decades is most apparent in looking at the number of schools with very high concentrations of minorities, which are becoming more common and even more monolithically radicalized than in the past. In 2010, the average white student is just as exposed to black students as they were in 1980, while the average black student is actually less exposed to white students than they were 30 years before. Understanding the history of teacher segregation helps to lay the groundwork for our analysis of teacher segregation today. This history can be clearly traced back to that same Brown decision, which ruled that separate schools for black and white students were inherently unequaland ordered that Southern schools integrate “with all deliberate speed.” As student integration began, however, teachers did not follow suit. Instead, massive layoffs for black teachers immediately followed. About 38,000black teachers lost their job in the decades after Brown—an estimated one-third of the nation’s black teachers. Since teaching represented one of the few paths available to the middle class for educated African-Americans, black teachers in the pre-Brown era was highly respected and held central positions in their communities. Thus, not only did these displacements represent a career loss for the black teacher and the loss of a role model or advocate for a black student, but they also symbolized the destabilizing of Southern black communities. Since this period of mass displacement, black college graduates have chosen to enter the teaching profession at decreasing rates, thanks to factors including widening career options and the rise of teacher competency tests. These historical roots of segregation persist and teachers of color are not spread evenly across today’s public schools. Rather, schools often act as pockets of minority teachers—or pockets without. A 2011 report estimated over 40 percent of public schools do not employ a single teacher of color. Instead, teachers of color are two to three times more likely than white teachers to work in disadvantaged schools—typically urban schools with high-minority student bodies. Segregation among teachers today is likely due at least in part to different teacher preferences. For example, both white and non white teachers report higher job satisfaction and turn over less frequently when their principal is their same race. Kirabo Jackson evaluated changes in the teacher workforce when North Carolina’s Charlotte-Mecklenburg Schools quit busing students and found teachers partially resegregated along with students. Furthermore, a survey of black male teachers reports that those who are the lone black teacher in their school had more negative perceptions of their working environment, compared to those who had four or more black colleagues. In addition, districts’ hiring and placement practices certainly play a part in continuing segregation as well. The latest research on this topic, conducted by professors at George Mason University, reveals that, in one large school district, white teachers were hired at a disproportionate rate compared to how often they applied. On the other hand, black teachers disproportionately received offers from black principals—if they got an offer at all. Black teachers were also much more likely to be hired in low-income schools. How does teacher segregation compare to the level of student segregation in the country? We use school enrollment and teacher staffing data from the National Teacher and Principal Survey to compute two types of segregation measures, which we explain in turn. The first type is a dissimilarity measure, a numerical value between 0 and 1 that is often interpreted as the share of the minority group that would need to switch schools to achieve perfect integration across schools. For simplicity, we calculate this measure between two racial groups: white and non white. 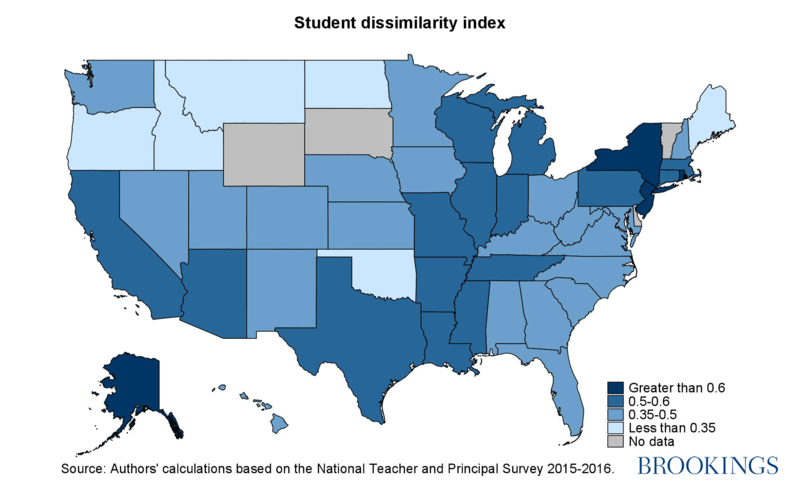 When we compute this statistic for teachers across all schools nationwide, we find a dissimilarity index of 0.61. In other words, three of every five non white teachers would need to be reassigned in order to achieve even distribution across schools. Remarkably, this is larger than the analogous dissimilarity computed among students in the same sample, which comes out of 0.56. To be clear, we have no expectation that this dissimilarity measure should be zero. Many teachers of color enter the profession precisely because they desire to work in schools that serve their own communities. Yet, current levels of student segregation are widely viewed as problematic; teacher segregation measures above those of students raise serious questions about structural racism in teacher hiring and assignment practices. The second type of segregation measure is exposure, representing the average level of exposure between races within a school. This measure also takes on values between 0 and 1, where 0 represents low exposure. We can compute different exposure measures depending on which group’s exposure we care about. When calculating the exposure of non white students to non white teachers, we estimate it to be 0.32—in other words, the average non white student in the data is in a school where non white teachers account for nearly a third of all teachers. When we calculate white student exposure to non white teachers, we estimate it to be far lower: 0.09. The large discrepancy in these numbers indicate vastly different experiences for students, depending on which types of schools they attend. For the many non white students who attend predominantly white schools, their chances of exposure to teachers of similar backgrounds are discouragingly low. WHICH STUDENTS SHOULD GET MORE TEACHERS OF COLOR? In this post, we have endeavored to explore racial segregation among teachers in public schools, and its relation to student segregation. We find racial segregation is actually higher among teachers than students, a surprising result given how much more autonomy teachers (but not students) ostensibly benefit from in choosing schools. This finding compels us to ask whether the current distribution of teachers of color is doing the most good for students. This analysis sends a clear signal that non white teachers are needed in far more places than we currently have them, and those many schools with no teachers of color are the places that need them most. In our view, informed by both evidence and values, teachers of color should be more evenly distributed across schools. Recent findings suggest the impressive benefits of racial matching between students and teachers do not appear to increase with dosage. Stated differently, a segregated faculty of black teachers for black students offers no obvious matching benefit beyond that expected by a diverse series of teachers over time. Instead, the ideals of a democratic, multicultural society are most likely to be advanced when teachers and leaders in our schools model that diversity for the nation’s youth. While we applaud the efforts of many districts to promote diverse teacher recruitment, most of these efforts have come from locales with high populations of minority student groups and already hire diverse teachers in fairly large numbers. 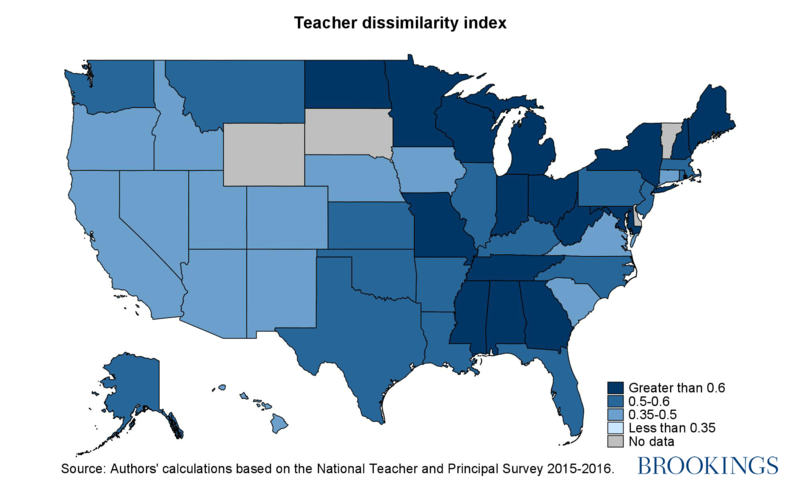 This analysis and other findings in our teacher diversity series send a clear signal that non white teachers are needed in far more places than we currently have them, and those many schools with no teachers of color are the places that need them most. Bethany Kirkpatrick contributed to this post.